Are you being fully present? With smart phones being virtually ubiquitous nowadays, an escape from the reality of right now is often only a swipe away. You surely have some friends who are constantly checking their email, facebook and twitter accounts on their phones or using WhatsApp, blackberry messenger and many other applications while being out with their peers. I believe these habits have a negative effect on how much we enjoy the presence. I got a new iphone recently after having my old one pick pocketed while travelling in Mongolia several months ago. It has reminded me that we do not need to be in connection with everybody else all the time and that it is much better to devote 100% of our attention to whatever we are doing at the moment. I do not use facebook on my iphone and check emails only when absolutely necessary. Instead of seeking an escape or a distraction from here and now, I focus fully on the person I am talking to at the moment, the food I am eating or the class I am sitting in. It makes me enjoy those moments much more (and by consequence the people I am with have a better time as well), learn more from them and be happier in general. Coincidentally, I saw a TED talk on the topic just yesterday, where Matt Killingsworth presented his research into tracking happiness concluding that ‘people are often happiest when they are lost in the moment… and that the more our mind wanders, the less happy we can be.’ You can watch it here. We can extend this concept even further. I for example always used to read if I was eating alone. I have stopped doing that couple months back and just enjoy the food now and let my mind process all information it has been getting whole day and relax a bit instead. If at all possible, I also do not like checking my watch when I am out with somebody as that again only takes me out of the moment and gets my mind spinning in different directions. So ask yourself a simple question. Am I genuinely present in my moments? When I am talking to my friends, working, watching a movie etc.? If the answer is sometimes no, I would encourage you to try devoting all your attention to whatever you are doing at a moment. You should see you will have a lot better time! 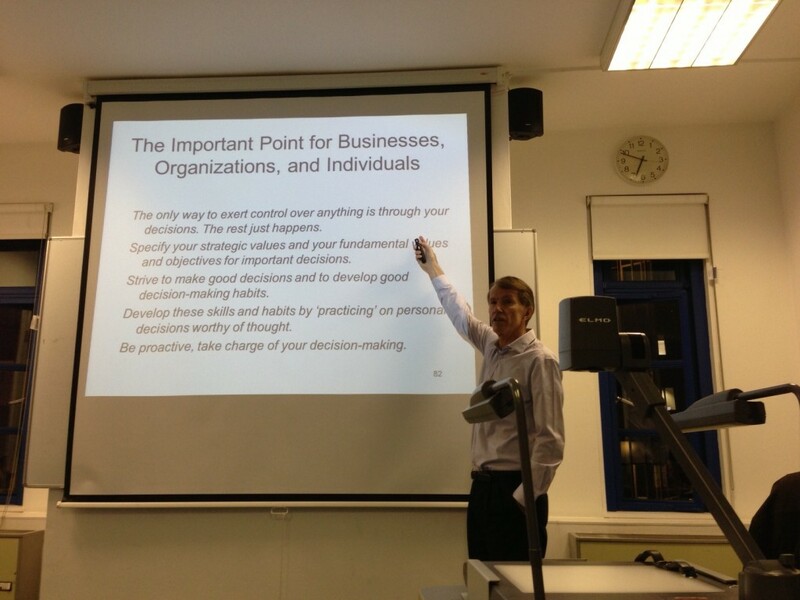 Professor Ralph Keeney, world’s leading authority on behavioural sciences from the Duke University, gave a lecture at LSE some time ago, offering couple interesting views on the topic. There are reactive decisions, which come to us and we are forced to make them, and there are proactive decisions which we generate and therefore we can exert more influence over them. According to Prof. Keeney’s research, 56% of deaths in the US in 2000 were consequences of people’s personal decisions such as to drink and drive or to smoke cigarettes and get terminal lung cancer. He estimates the figure to be 20% and 5% in 1950 and 1900 respectively. When making decisions, we are often guided by our objectives. It is therefore important to be aware of what our objectives are and to formulate them well. There are means objectives which’s accomplishment takes us to fundamental objectives. In business, getting a product to market first, gaining competitive edge or increasing sales are all means objectives to the fundamental one of increasing profits. In personal life, being healthy or rich are means objectives to fundamental ones such as living meaningful or enjoyable life. I have recently seen a very interesting TED talk by Amy Cuddy on how by consciously working with your body language we can shape who we are and how we come across. I think it is very true, watch it till the end!